Max: Welcome once again to our bi-weekly look at the seminal ’80s guns ‘n’ blazers cop drama, Miami Vice. 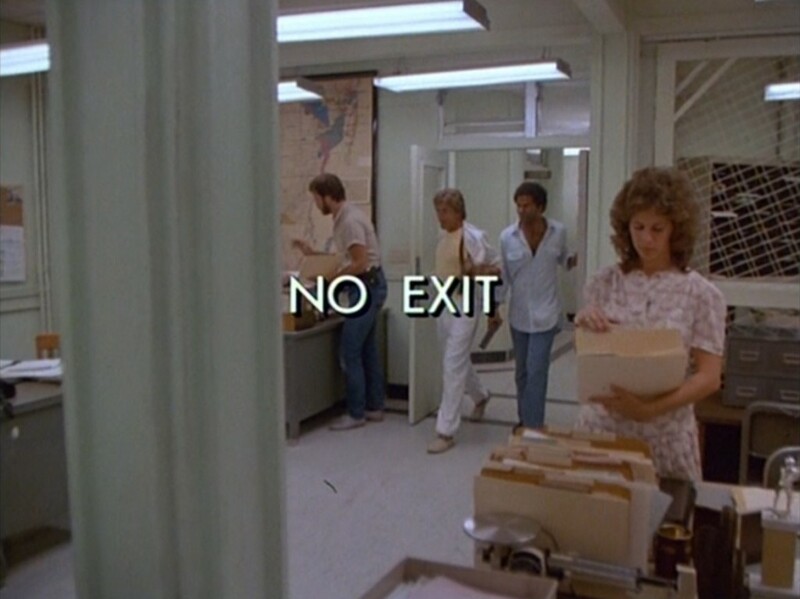 This week we’re talking about “No Exit,” an episode noteworthy for featuring a young Bruce Willis as the special guest star. Boy, this one is heavy. Jake: Man, is it ever. We start off with a sting gone bad, and a thug opening fire with an M60 machine gun. Our cold-open tone is suffixed with Tubbs having a straight-up rage meltdown at having been attacked with a machine gun, and it doesn’t get any smoother from there. Max: Let’s talk about this opening real quick. The first season of Miami Vice emphasizes the planning and timing that go into the vice squad’s busts, and it’s fun to watch this one play out. Jake: Absolutely! Every major player on the vice squad is here, chilling out and waiting for a deal to go down. Crockett, reclined in his Ferrari (as one does) is the contact, and we get a great view of everything going to hell, with a nice bit of comedy from resident screw-up detectives Switek and Zito. Detectives Gina and Trudy are completely wasted here, as they often are in early episodes, but it’s still a great picture of all our main cops working together in separate roles. Max: I honestly forget how violent this show is. Even today, the one thug opening up on a crowd with an M60 is sort of shocking. Tubbs’s little freak out is perhaps a tad corny, but I like that Miami Vice is a show where our heroes actually get scared when they’re thrown in the line of fire. Jake: The villain of the week is Tony Amato, a ruthless, violent arms dealer played by a little-known actor named Bruce Willis. Max, if my understanding is right, this is pre-Die Hard Willis, isn’t it? Max: Well before Die Hard and about a year before Willis became a pretty big TV star with Moonlighting! Willis is extremely hard to watch in this episode as he terrorizes his wife Rita (Katherine Borowitz), but it’s definitely a stellar performance. It’s interesting watching Willis play a completely unsympathetic psychopath here, a very big departure from his trademark sarcastic-but-likable action hero roles. Amato’s hair-trigger temper gives his scenes in this one an air of volatility in an episode that’s already pretty tense. Jake: Max, I picked this episode specifically because of Bruce Willis. This is an absolutely amazing turn as a villain. He spends the majority of the episode out of reach but under surveillance from Crockett and Tubbs, who largely watch him violently mistreat his wife. It’s legitimately disturbing to watch Willis turn on a dime from sarcastically charming to terrifyingly violent. The detectives actually enter the fray when Amato’s wife Rita tearfully tries to hire a hit man to kill him. Crockett impersonates the hit man and talks her down, recruiting her as a mole. 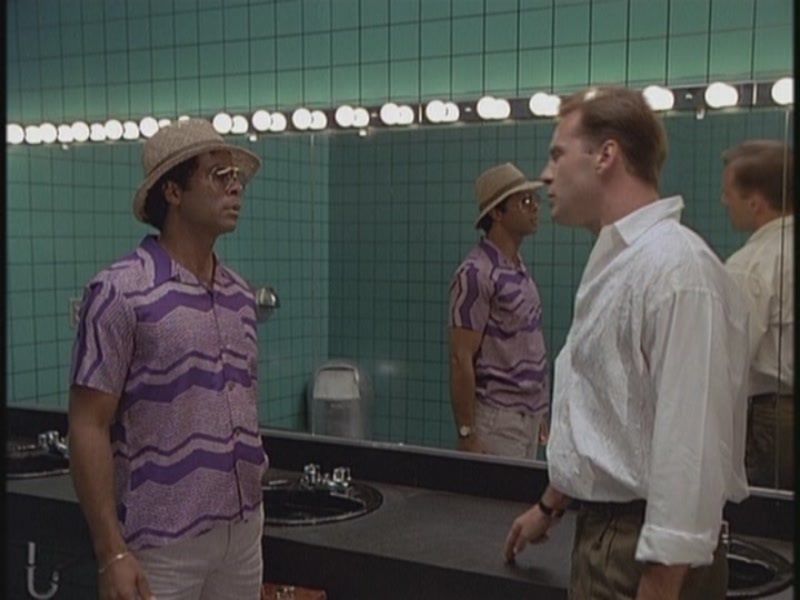 It’s largely a low-action episode, relative to many others, but most of the main character meat comes from seeing Crockett and Tubbs working in silent tandem (like best friends do) and working under the new Lieutenant Castillo, which is likely the most hard-assed role Edward James Olmos has ever played. Max: There’s kind of a bait and switch going on with this episode, where Amato’s scheme to sell a bunch of black market guided missiles takes a backseat to how Amato’s abuse is pushing Rita to the breaking point. It’s unquestionably exploitative on the show’s part but, like you said, the authenticity of Willis’ violent mood swings is chilling. The choice to play a romantic Teddy Pendergrass song over an extended sequence of Amato assaulting his wife plays out like something in a horror movie. This is one of two very specific uses of licensed music, the other being (of course) a Phil Collins song over the final takedown scene. Jake: This is a powerful example of not only Miami Vice’s use of women as fodder and plot points, but popular fiction in general. This episode is very well put together and appropriately distressing, but it is still undeniably uncomfortable in the way it portrays women. Rita’s distress throughout the episode is often used to illustrate Crockett and Tubbs’s horror at her involvement. A product of its time, perhaps, but ultimately very unpleasant. This coupled with what Amato is selling, guided missiles that can covertly take down passenger airliners, leaves this episode cast heavily in shadow. It’s whiplashy to see Tubbs doing his Jamaican accent undercover gag followed immediately by Crockett witnessing Amato brutally beat Rita and not intervening. This episode sets up the very common Miami Vice feel of an unhappy ending, something that never stops being uncomfortable to watch. Max: The biggest problem with this episode is definitely that it isn’t sure if it wants to be a Very Special Episode about domestic violence or a straightforward crime caper. The stuff with Tubbs posing as the missile buyer was really good, if disposable. I LOVE the henchman that’s champing at the bit to explain how the rocket launcher works. The connective tissue between the A and B plots being that they need to stop Rita from ordering a hit on Amato is clever, but the execution sorta gets whiffed. Going back to the unhappy ending, this EXACT kind of ending (a character, usually a woman, is pushed too far and kills the villain of the week) is very popular on Miami Vice. I think “Rites of Passage” does a much better take on this, but Amato (seemingly) dying at the hands of his wife is the painfully inevitable conclusion this episode has to reach. Jake: Absolutely. If I had a nickel for every time this show ended on a freeze frame of Crockett screaming and trying in vain to stop someone from killing someone or killing themselves, I’d be able to afford that damn Ferrari he drives around in. Though this episode is stylishly put together and very well paced, it hinges very hard on forced emotional beats at the cost of outside characters, particularly Rita. As we’ll see going into the future, all that truly matters in a Miami Vice episode is how it impacts our two leads, for better or for worse. Max: “No Exit” is an uneven episode, very much a display piece for the show’s strengths and weaknesses as a whole.